For a bird-pollinated plant, Babiana ringens is characterized by two unusual features: a ground-level floral display and a naked inflorescence axis that projects vertically above the flowers. Malachite sunbirds, the primary pollinators of B. ringens, use the naked inflorescence axis as a perch while foraging for nectar. This promotes outcrossing by positioning the birds so that they make contact with the reproductive parts of the flowers. Babiana hirsuta is the sister species of B. ringens and has similar bright red flowers that are also pollinated by malachite sunbirds. However, in this species the inflorescence axis is characterized by numerous side branches, resulting in a much larger floral display. The naked axis and basal flowering of B. ringens appears to have originated through the suppression of apical flowering branches in an ancestor with a similar appearance to B. hirsuta. In a manipulative field experiment, the apical flowers were removed from B. hirsuta inflorescences, simulating the appearance of B. ringens. As a comparative treatment, basal flowers were removed, leaving an apical display on the otherwise naked B. hirsuta inflorescences. Inflorescences with only apical flowers were heavily grazed by antelope; however, no herbivory occurred for inflorescences with only basal flowers. The differences in herbivory affected reproductive success: inflorescences with only basal flowers set significantly more seed than those with only apical flowers. The authors propose that this position-dependent herbivory may have contributed to selection for ground-level flowering and the unique origin of the naked bird perch in Babiana. Credit: Photo credit: C. E. Smith. Floral displays, such as the color, shape, size, and arrangement of flowers, are typically thought to have evolved primarily in response to selection by pollinatorsfor animal-pollinated species, being able to attract animal vectors is vital to an individual plant's reproductive success. But can herbivores also exert similarly strong selective forces on floral characters? 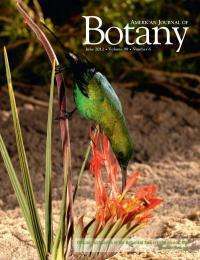 New research on two sister species in South Africa suggests that this may indeed be the case for inflorescence architecture in the rat's tail plant, Babiana ringens. By modifying the primary location of its floral display in response to pressure from mammalian herbivores, B. ringens may have not only reduced floral herbivory, but may also have enhanced pollination by providing a specialized perch for its principal pollinator. Endemic to the Cape region of South Africa, Babiana ringens produces bright red flowers that are situated close to the ground on an unusual inflorescence axis that protrudes above the floral display. Its primary pollinator, the malachite sunbird, is attracted to the flower's red color and abundant nectarthe color, shape (tubular), and size of the flowers indicates that these characters likely evolved in response to sunbirds. In previous research, Bruce Anderson (University of Stellenbosch, South Africa) and colleagues discovered that the protruding modified inflorescence axis serves as a perch for sunbirds, allowing them to turn upside down in a perfect position to access nectar and facilitate pollination. In Babiana ringens, the inflorescence axis is modified such that growth of the apical side branches is suppressed and flowers are only produced on a single branch at the ground level. A close sister species, B. hirsuta, exhibits similar inflorescence morphology, except that flowers are produced on side branches all along the stalk and not just at the base. Caroli de Waal, a graduate student at the University of Toronto, was intrigued by how the bird perch in B. ringens may have originated. This required determining the potential selective forces responsible for influencing the inflorescence architecture in the two Babiana species. Based on field observations, De Waal and colleagues investigated whether herbivory might have played a role in the evolution of this unique bird perch. Their findings were recently published in the American Journal of Botany. "It is hard not to be curious about the origin of the curious rat's tail of Babiana ringens, which is unique in the flowering plants," commented Anderson. "We noticed that in populations of the sister species, B. hirsuta, many plants had suffered damage from herbivores, with the upper portions of the stems completely eaten off," De Waal noted. "We then started to wonder: what if herbivory could contribute to selection for the floral display in B. ringens?" Given the close phylogenetic relatedness of these species and their similar floral morphologies and pollinators, De Waal and colleagues hypothesized that the specialized bird perch in B. ringens may have originated from a B. hirsuta-like ancestor through reduction in the production of the side branches. This could happen if mammalian herbivores preferentially eat apical flowers and left the basal flowers alone. Indeed, when De Waal and co-authors compared herbivory rates in three B. hirsuta and three B. ringens populations, they found much higher levels of herbivore damage to B. hirsuta---as much as 53% of the inflorescences were eaten. Moreover, they found that Cape grysbok (the primary herbivore) mostly grazed the top parts of inflorescences, leaving the basal parts to continue flowering. In comparison, herbivory in B. ringens was much lower and the ground-level flowers were never eaten. To further test their idea, De Waal and colleagues conducted a field experiment with B. hirsuta in which they manipulated flower position along the stalk  they removed side branches in plants so that they displayed either flowers only at the top or only at the bottom of the stems (the latter resembling the display of B. ringens). Using cages, they then excluded herbivores from half of the treatments. "Our most important result," De Waal stated, "is that flowers at the tips of stems were eaten by browsing antelope, whereas flowers at ground-level were consistently ignored." Notably, this was even the case for plants that were not protected from herbivores by cages, yet were manipulated to have only ground-level flowers. "Significantly, plants with only ground-level flowers produced more seeds," she said. "This means that plants that manage to escape damage by herbivores also have higher reproductive success, and this may be the reason why B. ringens evolved its unusual ground-level flowers." Moreover, Anderson adds, "The overwhelming herbivore preference for plants with only apical flowers indicates why plants like B. ringens, with basal flowers, could have evolved while plants with only apical flowers would be maladapted." "Our results indicate that in addition to pollinators, herbivores can also be important selective agents on inflorescence architecture," concluded Anderson. "This is significant because most scientists have attributed variation in floral display to selection by pollinators and the importance of herbivores is often forgotten."